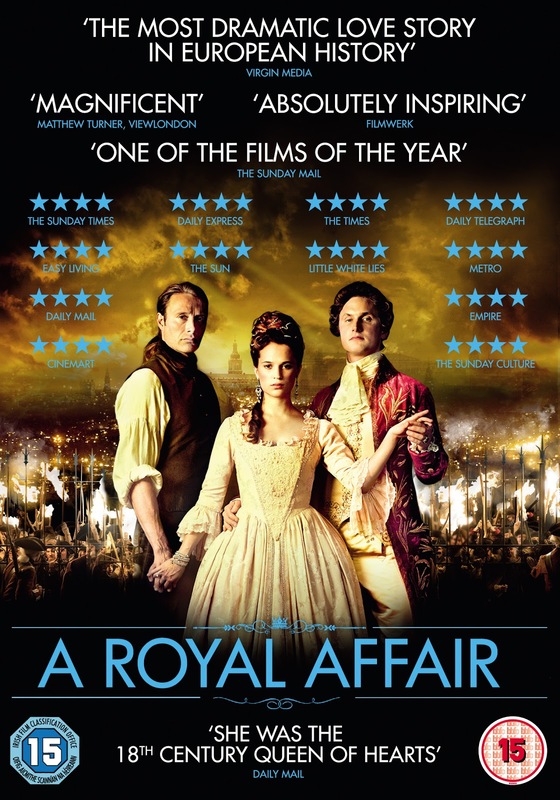 The Royal Affair is a movie based on a true story. For the second time on this blog, I’m gonna praise ”Monsieur Le Chiffre” aka Mads Mikkelsen for his outstanding perfomance. From director Nikolaj Arcel (known for the Girl with the Dragon Tattoo). The film includes Politic, Romance, Scandals, Drama, Revolution. Everything a good motion picture needs to be successful. It is about the Danish Royal Family on the Trone during the 18th century. King Christian was suffering from a mental illness. The king’s excesses included alcohol, sado-masochism, handsome young men and prostitutes. In fact, the only thing Christian was interested in was to play all the time. He also admired theater and irresponsible behaviour. In retaliation, he does not care about politics or his countries’s situation. Princess Caroline Matilda, sister of insane king George III of Great Britain was married off to mad king Christian VII of Denmark at the age of 15. The Queen played by Alicia Vikander accepted her life (one cannot say that she lived a life, it was more like a big prison) on the King’s side. She gave birth to a boy, Frederik VI. The Queen was depressed until she met Christian’s personal consultant Johann Struensee (Mads Mikkelsen). Struensee was Chiristians’ doctor, however, in some point he acted more like a companion. Christian’s admiration for Struensee went so far, that he handed out the full sovereignty to him. The only signature that counted at that point was the doctor’s one. The drama includes a passionate love story between the Queen and the doctor. During the two hours one constantly feels the pressure for both of them. Partly, I felt exceptional sad. The drama includes very emotional strong scenes. The motion picture became a participant in competition at the 62nd Berlin International Film Festival and has been elected as the Danish entry for the Best Foreign Language Oscar at the 85th Academy Awards. About wether the original facts are fitting the movie, I cannot say much. I havn’t got into the danish history yet! This entry was posted in Cult, Film, Uncategorized and tagged A royal affair, Alcohol, Alicia Vikander, Cinema, Danemark, Drama, Mads Mikkelsen, Motion Picture, Movie, Nikolaj Arcel, Politics, romance, Rousseau, Voltaire. Bookmark the permalink.